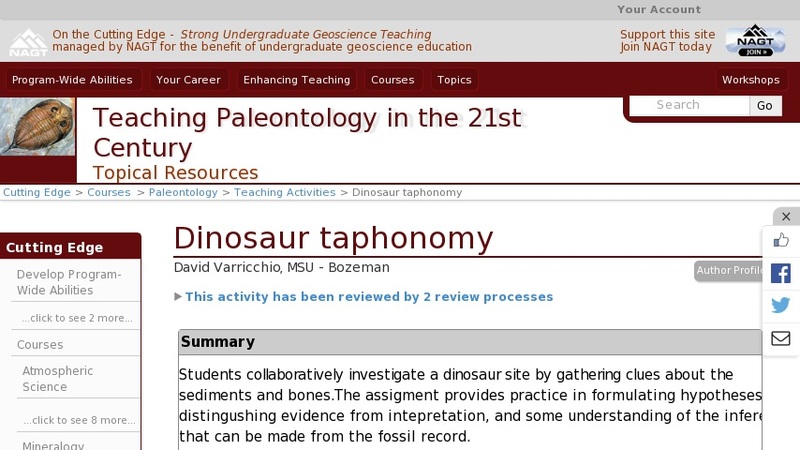 In preparation for this assignment, students have read a brief section in their textbook on the fossilization process as it relates to dinosaurs. In addition they will have had one lecture on taphonomy that briefly covers the processes that transpire from the death of a dinosaur until its discovery by a paleontologist. Students work in groups. Each group is given a quarry map of a dinosaur locality and no other information. The exercise is framed as detecive work, where the "scene of the crime" is represented by the quarry map. The objective is to gather clues to make an informed intepretation. Students can obtain additional clues, but to do so, they must formulate a hypothesis that can be tested by the information they seek. However, they only get to formulate 10 hypotheses. An untestable hypothesis wastes a potential clue. Once students have gathered all their clues, they are encouraged to discuss the significance. Students write up their own interpretation and its limitations individually. The exercise gives students practice with taphonomic data and both its potential and limitations; hypothesis formulation; and examining differing viewpoints as group discussions often lead to debates about what information would be most important.